Well, it had to happen. Apple’s iPhone 6s and iPhone 6s Plus handsets have only been with us officially for less than a week, but we’ve already seen the hardware subjected to a number of destructive tests. We’ve seen the standard waist height drop tests designed to simulate an actual real-life dropping of the handset, followed by the slightly more farfetched test of seeing what happens when the iPhone is doused in liquid nitrogen and then annihilated with a sledge-hammer. Now, we see just how well Apple’s latest hardware performs against a .50-Cal round fired from a high-powered Barrett M82A1 sniper rifle. 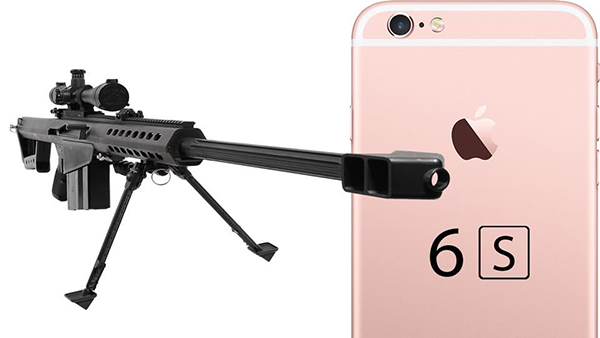 It probably won’t come as a shock that even though the new iPhone 6s models are manufactured from higher-grade 7000 series aluminum, they aren’t really a suitable opponent for a Barrett M82A1. The whole experience has been captured on slow-motion video for the world to enjoy, or perhaps recoil in horror if you cannot see the justification for shooting a defenseless piece of premium technology with a weapon of destruction. Apple’s latest iPhone range may be manufactured from a new stronger metal, but that’s a decision that was made internally to prevent a re-occurrence of last year’s “Bendgate” scandal. It’s highly unlikely that the Cupertino-based company were debating the chances of a high number of iPhone owners getting tagged by a .50-Cal round when planning out the engineering materials. Still, the video itself is worth a watch, purely for the entertainment and production value. There’s something mildly enchanting about seeing how the iPhone reacts to the penetrating bullet in slow-motion. On that topic, it won’t surprise you to learn that the iPhone 6s reacts exactly as you would expect when it’s hit by the .50-Cal round. Apple’s new phone is utterly obliterated and explodes into more pieces than it was actually manufactured from. It turns out that not even the introduction of the Rose Gold color is going to make the phone impervious to high-powered, blunt force destruction, but you already knew that. If you had to choose your favorite method of iPhone destruction, what would it be? .50-Cal round ripping through the shell or submerging Apple’s hardware in liquid nitrogen and taking a hammer to it? Check out the video below, and let us know in the comments section below. There goes the worst iPhone ever made. Your mom is the worst person ever made. She gave birth to an idiot. It is just stronger not bulletproof! He should definitely take that phone back to the apple store in pieces…and get someone to video their reaction.